Food is an important part of every festival and it is no different for Lohri. The festival is incomplete without the traditional dishes that are prepared every year during the occassion. TheHolidaySpot presents you with the cooking directions for some of the most popular traditional Lohri dishes. Check out these mouthwatering Lohri Recipes and add more flavour to your festivities. If you enjoy making these, click here and share them with your friends and loved ones. Have a grand Lohri celebration! Make cool Lohri crafts using these easy stepwise directions and gift them to your buddies and close ones during the festive time. Boil jaggery in water to form a thick syrup. To check for the right consistency, add few drops of the syrup into water - it should solidify immediately. Now add roasted peanuts, rice, cardamom powder and dry coconut flakes. Stir, gently. Allow the mixture to cool for few minutes. Smear your palms with a little ghee to roll out balls. Time : 1 hour; Makes : 12 pieces. Grind the bajra coarsely in a mixer and mix with the moong dal. Transfer the mixture in a pressure cooker with 250ml water and salt. Cook for 10 minutes on low heat. Turn the heat off after three whistles. Allow the steam to escape. Add hot water if required. Mix in ghee. Serve with pickle or deseeded green chillies. Time : 30 minutes; Makes : 4 servings. Mix the maize flour and salt in a shallow plate. Make a "Well" in the centre; add a little water at a time to knead the flour into a dough. Divide into equal-sized balls. Put a square sheet of foil on the surface on which rotis will be made. Lightly flour the surface. Put a ball of the kneaded dough on the paper and cover with another piece of foil. Press with the ball of your palm till it becomes size of a roti. Remove the foil cover and transfer the roti to a hot skillet. Cook on low heat, turning till both sides are roasted. Serve with butter. Time : 15 minutes; Makes : 4 servings. Roast the sesame seeds in a dry skillet. Grind coarsely in a blender on low speed. Heat the jaggery in a thick-bottomed vessel till it melts completely. Grease a tray with butter and leave aside. Mix all the ingredients along with ground sesame seeds and microwave for about 3 minutes. Stir the mixture properly and microwave again for 3 minutes. Remove when it starts to bubble. Stir till it becomes thick. Spread the mixture on the greased tray. Cut in squares when cool. You can refrigerate the barfi for 10 days. Heat a pan and roast sesame seeds on low heat. Keep stirring constantly to avoid them from spluttering. After roasting, cool and then pound them. Prepare thick syrup of jaggery by boiling it with ½ cup water over low flame. Add the roasted and pound til to the syrup. Brush some oil on a rolling board. Spread the sesame-jaggery mixture over cling film. Press it to about 1cm thickness. Cool the mixture sufficiently and cut into square pieces. Til gajak can be stored in an airtight container for up to two months. Time : 1 hour; Makes : 12 servings. Heat a thick-bottomed kadhai and roast the flour. Grate jaggery. Mix the grated jaggery with flour. Stir gently for 10 minutes on medium heat. Add ghe, elaichi powder, badam powder and mix. Grease your palm with ghee and roll out balls. Laddoos can be stored in an airtight jar for two months. Time : 30 minutes; Makes : 12 pieces. Heat the sugarcane juice in a heavy-bottomed pan. Wash the rice and add to the sugarcane juice. Cook the contents on low flame for 15 minutes. Take care to gently remove any dark froth the collects at the surface. Remove from the fire when thick. Serve hot or cold after garnishing with badam-kishmish or cold, unsweetened fresh cream. Time : 1 hour; Makes : 6 servings. Til (Sesame seed) - 1 cup. Chawal (Rice) - 1 cup, soaked for 2 hours. Ground nut seeds - ¼ cup, roasted and unsalted. Desi sakkar (sugar) - A little (for taste). Pour the sesame seeds into the kadhai. Roast till the seeds change colour to light brown. Pour ghee into the pan and melt. Add in the soaked rice and roast for 5 mins or until soft. Roast groundnuts separately in ghee. Combine roasted rice, ground nuts, revadis and dry fruits in the mixing bowl. Add desi sakkar and serve. Sarson (Mustard Green) - 1 kg, finely chopped. Spinach - ¼ kg, finely chopped. Lal mirch (Red chilies) - 2. Garlic cloves - 4, minced. Ginger - A 2 cm long piece, minced. Gram flour - 2 tbsp. Hari mirch - 2, minced. Pour water into a kadhai. Add in sarson and spinach. Boil until cooked. Mash the vegetables and keep aside. Pour about 4 tbsp of ghee into a pan and melt. Add in the spices (green chillies, garlic, ginger and broken red chillies). Saute until browned. Add gram flour to a little water and form a paste. Combine this with the mixture you have made and cook for about half an hour. Add 1 tbsp of butter on top. 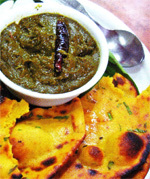 Serve hot with Makki di roti and it makes an irresistible combination for Lohri. Badam - 1 cup, chopped. Pista - 1 cup, chopped. Cashew - 1 cup, chopped. Jaggery - ¼ cup, grated. Kesar - A few, soaked in milk. Ghee - 3 big spoons. Add this to 2 big spoons of ghee in a kadai and melt to form a fine paste. Add in kesar, badam, pista and cashew nuts and combine well with the mixture. Continue mixing till the mixture leaves the sides of the kadai. Pour the remaining ghee into the tray and spread. Add in the dry fruit mixture and spread uniformly. Cool the mixture and slice into pieces.